It is this comprehensive health care that is provided by the VA that allows Veterans to return to a productive lifestyle after returning from military service. At the Veterans Affairs (VA) Maryland Health Care System every day is Veteran’s Day. But on Nov. 11, the entire nation honors those 23 million Veterans who took a solemn oath to protect and defend all that we hold dear. Even after completing their service time, Veterans continue to demonstrate bravery in their daily lives. Tony Cox and Karl Dorman are two Maryland Veterans who, despite becoming disabled, pursue full lives with help from the VA Maryland Health Care System. Cox, 51, a former Marine now confined to a wheel chair after becoming paralyzed from his waist down, is an active leader for fellow Veterans at the Baltimore VA Medical Center and Dorman’s teammate at the recent VA Summer Sports Clinic. Dorman, 37, a Cecil County resident and former member of the Maryland National Guard, regularly roller blades, snow boards, skis, kayaks, swims and cycles, even after losing his part of his leg. At the VA Maryland Health Care System Veterans are offered comprehensive health care, including medical, surgical, neurological, primary, mental health and long-term care on both an inpatient and outpatient basis at three inpatient facilities and five outpatient clinics throughout the state. It is this comprehensive health care that is provided by the VA that allows Veterans to return to a productive lifestyle after returning from military service. Cox became a single parent the moment his son was born nearly 18 years ago, and talks about the rigors of being a single father while battling his “ordeal with drugs” and his multiple efforts to kick them. “My son was like my rib,” said Cox, who credits the intensive substance abuse outpatient treatment he received at the Baltimore VA Medical Center and the Father’s Group with his success in finally overcoming his addiction issues and improving his fathering skills. “Once I realized that I had to participate in my own recovery and take responsibility for it, that’s when the treatment began to stick,” he said. The Father’s Group is an elective psychoeducational group that is part of the VA Maryland Health Care System’s Intensive Outreach Program. The group offers a holistic perspective for men struggling to kick substance abuse issues. The treatment includes improving relationships with their children and families. Dorman uses the C-leg to walk but relies on other, higher-tech prosthetic legs to perform his sports and outdoors-related activities. The sophisticated C-leg prosthetic contains a microprocessor to control it and receives feedback from multiple sensors that anticipate a user’s next move and makes adjustments in real time. Using any of the prosthetics, however, isn’t an overnight skill. “I fell on my face many times,” Dorman says. “It takes some getting used to and a lot of falling,” he says. But it also takes a lot of getting back up, and Dorman’s persistence helped him gain proficiency with his prosthesis. Because of his active lifestyle, Dorman owns a variety of even higher-tech prosthetic legs for his many activities. Dorman also makes time to motivate and demonstrate to other Veterans struggling with amputations that things can and do improve. Along with Cox, Dorman attended the Summer Sports Clinic, where he was able to challenge himself physically and mentally. Dorman and Cox are among the more than 52,000 Veterans, ranging in age from 21 to 91 from World War II to Operation Enduring Freedom/Operation Iraqi Freedom, who are served annually by the VA Maryland Health Care System. Editor’s Note: To interview either Karl Dorman to Tony Cox, please contact Rosalia Scalia at 410.605.7464 or via e-mail at rosalia(dot)scalia(at)va(dot)gov. The VA Maryland Health Care System (VAMHCS) provides a broad spectrum of medical, surgical, rehabilitative, mental health and outpatient care to veterans at two medical centers, one rehabilitation & extended care center and five outpatient clinics located throughout the state. More than 52,000 veterans from various generations receive care from VAHMCS annually. Nationally recognized for its state-of-the-art technology and quality patient care, VAHMCS is proud of its reputation as a leader in veterans’ health care, research and education. It costs nothing for Veterans to enroll for health care with the VA Maryland Health Care System and it could be one of the more important things a Veteran can do. For information about VA health care eligibility and enrollment or how to apply for a VA medical care hardship to avoid future copayments for VA health care, interested Veterans are urged to call the Enrollment Center for the VA Maryland Health Care System, Monday through Friday, from 8 a.m. to 4:30 p.m. at 1-800-463-6295, ext. 7324 or visit http://www.maryland.va.gov . Follow us on Facebook and Twitter. 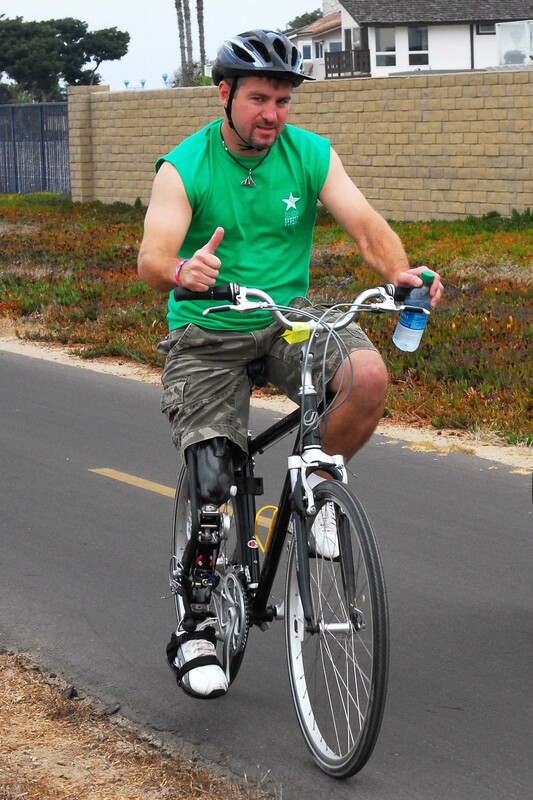 Karl Dorman gives the thumbs up while competing in a cycling event at the VA Summer Sports Clinic in San Deigo. Howard "Tony" Cox hoisted himself up the climbing wall, captured the bell and flag, leading his Team Neptune to victory at the VA Summer Sports Clinic.